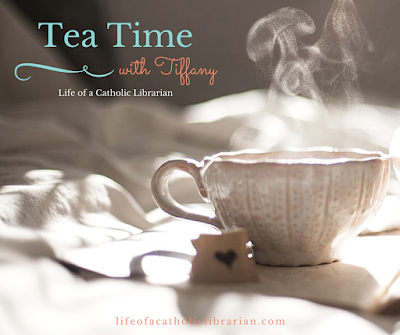 Life of a Catholic Librarian: Tea Time with Tiffany Episode 9 - Summer Ordinary Time with kids! Tea Time with Tiffany Episode 9 - Summer Ordinary Time with kids! ...because my legal pad had suddenly become light on ideas for video post topics. Time for a brainstorm! And brainstorm I did, and thus I have fun topics for both this week and next! (And leave comments with your ideas for video posts, because I will gratefully receive them!) This week I'm going to be talking about faith activities with kids over the summer, during this long stretch of Ordinary Time between Pentecost and Advent. I'd love it if you'd also write in with your ideas! Saint story books. Henry and I are currently reading a nightly entry in Saints for Young Readers for Every Day, Vol. 2: July-December. This one is great for middle readers! Patronal feast novenas. For my kids those feasts both fall in July, the 13th (St. Henry II) and the 26th (Sts. Anne and Joachim). Extensive calendar of saint feast days to plan novenas and other activities. Dictionary of Patron Saints' Names is in fact still in print, if you want to find a saint for a name otherwise lacking a patron! Think ahead to Advent - Christmas in July, baby! Saint dolls (softies and wood dolls) for the upcoming feasts of St. Nicholas and Christmas. This year I'm thinking of getting both kids a St. Nicholas doll, and also having an Our Lady of Guadalupe/St. Juan Diego theme. Good time to buy Advent calendars. This is the wood magnetic one that I am coveting. 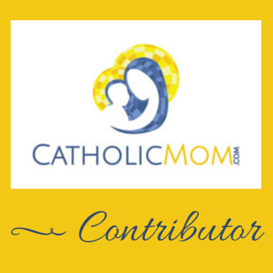 Saint of the week: St. Joseph, patron of families! OK, now it's your turn: do you have anything special that you do faith-wise during the summer Ordinary Time? Do you have any ideas for future topics for the Tea Time series! Do write in and let me know! My husband and I were just talking about patron saint names last night! :) I couldn't really find any information on St. Cynthia though. Does your dictionary of saints have any info on her or a suggestion for someone else with a similar name? Thanks! So I also looked up Diana, and there is a Bl. Diane d'Andalo (1201-1236), feast date of June 9th. Thanks, I'll have to look into those!! I've been trying to come up with more video post ideas, but I haven't been able to come up with any... I'll have to think about it some more. Cindy, yes, sometimes inspiration takes time. ;-) Send them anytime!